Natural Skincare - No Nasties! Our philosophy is simple - natural skincare that provides healing, nourishing and effective results with medicinal herbs that have been used successfully for centuries. These products are handcrafted with love in small batches using all natural ingredients including medicinal herbs and essential oils to ensure your skin is soothed, moisturised and beautified. Nourishe Skincare is free of all nasty chemicals, artificial fragrances, colourings, mineral oils, petrol chemicals, silicons, sulfates & parabens and is not tested on animals. All products are made in New Zealand. 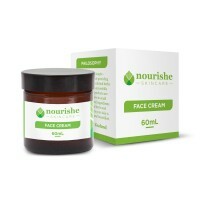 This face cream is handcrafted using medicinal herbs and essential oils&nbs.. This body and bath oil is handcrafted to ensure your skin is soothed, moist.. This cream is handcrafted to ensure skin is soothed and moisturised, reduci..